Over at Peak Energy, Monkeygrinder has an excellent and sobering post on the need to strike a balance between realistic pessimism and realistic hopefulness, without falling prey to the lures and snares of terriblisma on the one hand, and complacent optimism on the other. The painting above, since you asked, is called Apokalyptische Landschaft. It was painted by Ludwig Meidner, way back in 1912. 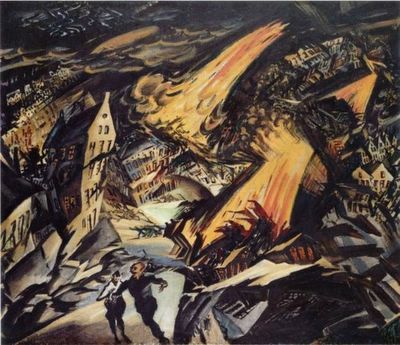 Meidner's era, like ours, aestheticized catastrophe to a remarkable extent, and Meidner was one of those melancholic artists who saw destruction as horrible but necessary, given the degraded state of the world. His contemporaries in the Italian Futurist movement, by contrast, called war "the world's only hygiene" and celebrated the idea of destruction as a noble goal in and of itself. To them, destruction was not merely punitive or cathartic, but something more akin to a spiritual duty. I assume that anyone who's reading this doesn't want the world to be violently, gruesomely transformed a la Meidner or the Futurists, no matter how likely or even inescapable that fate might seem. In this regard, Rorschach has aptly quoted Gramsci's call for "pessimism of the intellect, and optimism of the will." And as a personal stance, that's pretty close to ideal in my book (though the intellect does have a knack for undercutting the will, as I know all too well). As a public, rhetorical stance, though, I'm afraid it's insufficient, and possibly counterproductive. There's a real longing for upheaval and catastrophe in some quarters, and horror stories about the future - even if they're intended to shock people into awareness - may amount to little more than fuel for that fire. Fortunately, there's more to people and societies than the urge to punish and be punished, to kill and be killed; if there's hope for us, I believe it lies in disavowing pessimism, catering to healthier societal urges, and turning unhealthy urges in more constructive directions. I argued a few months ago that powerlessness corrupts, and I really feel this is a truth that can't be overstated. To the extent that we encourage a sense of powerlessness, we push people towards the emotional adaptation of aestheticizing or spirtualizing or otherwise justifying disaster. It may even be that the current epidemic of gleefully destructive moral nihilism on the Right is partially a response to the warnings of impending ecological or nuclear disaster promulgated by the Left in decades past. Who knows? At any rate, it seems obvious that Americans do feel powerless. They're looking for something to fill this void...and when they can't beat it, they join it. In answer to Monkeygrinder's question, I don't know what might "save" us from the problem of peak oil (or any other looming disaster). But I do know we need a strong public demand for progress, and a general willingness to make sacrifices. We have thousands of people in this country who were willing to give up their own lives, or the lives of their sons and daughters, for Bush's cruel hoax of a war. If that degree of commitment could be refocused on something useful, much smaller sacrifices could have much more positive results. Therefore, I think the main issue here is one of framing. The Right needs to be seen by the popular mind as a group of people who stand in the way of something new and exciting. We need to convince people that there's a brighter, more interesting world right around the corner, and that the main thing keeping us from reaching it is a relatively small group of greedy people who lack vision and wisdom. Of course, we might not find a technological fix for our energy problems. But the more years we can squeeze out of whatever oil's left, the better our chances are. In my opinion, the chance that we'll solve at least part of the energy problem in the next twenty years is far better than the chance that we'll have a working space-based missile defense program in the next fifty. As I said, these are very disorganized thoughts. But I do think that if we can't come up with a miraculous solution like cold fusion, we need an innovation economy that produces lots of little solutions, and promotes cooperation between experts - and amateurs - in many different fields. Meanwhile, on the rhetorical level, we need to give people hope, and a personal stake in seeing the world change. If a certain amount of apocalyptic thinking comes from emotional dissatisfaction with what passes for life in these United States, then we need to make people eager for a more wholesome form of "regeneration" than fascism offers. As it stands now, I'm afraid that apocalyptic scenarios are simply too emotionally attractive to have any reliable transformative power. As odd as it sounds, we're simply going to have to offer people something a bit more fulfilling than the end of the world. Phila, inspite of your concern that this was disorganized, I found this posting really clear and provactive. I love the way you brought together the two ends of the political spectrum here. And it makes sense, ultimately there are issues where we share common ground with the average right winger. It makes sense to focus on the stuff we can fix. In Philadelphia our Public Transit system is almost broke, our roads are clogged with cars and, while the buses are used in the inner city, it's very expensive. The trains are used by the suburbanites cause the poor folks can't afford to take the train 'cause the fare is so high. What we have, essentially, is public transportation segregated by class. I've started wondering why we don't have FREE public transportation. We could pay for it with taxes on people who drive private cars. Soon we'd all be on the buses and people wouldn't feel stigmatized or afraid to take the bus as they do now. i try to not obsess about impending doom, but i have thought for many years that our financial structure must collapse any day; that in spite of medical wonders some new plague will certainly find advantage in overcrowded cities; that geological processes have not stopped and the tectonic plates are still grinding against each other. that's all intellectual, though i prefer to call it realism rather than pessimism. shows how wrong i can be. as i live day to day fairly cheerfully, tho not so much lately in view of national policy, i suppose i have optimism of will. i think you're onto something big and important with that idea of more fun and better toys. apocalyptic scenarios can only, it seems to me, have transformative power in a negative sense: change or die. a positive vision of possibilities certainly spurs me to action more than does fear. i seem to recall we used to call it the "reactionary right" and got it to stick. liberalism was hopeful of a brighter future. There's a real longing for upheaval and catastrophe in some quarters, and horror stories about the future - even if they're intended to shock people into awareness - may amount to little more than fuel for that fire. I don't have time to review this post and give it the consideration it deserves, but I wanted to note that this is as succinct and apt a description of apocalyptic literature and philosophy as I have seen. "Apocalyptic" not only predicts a cataclysmic change in the status quo, but embraces it, and even seeks to "make it so." Peak Energy has as reasonable outcomes many doomsday scenarios. It is an apocalyptic fugue. Humor, common sense, enjoy the moment to the fullest, live. That's actually something I meant to work in. We're not guaranteed a future, individually or en masse, no matter how much cheap energy we find. But we're obliged to go about our business all the same, and we may as well enjoy it if we can. For several weeks I was driving myself crazy with the impending disastrous consequences of previous generations. The information or misinformation out there can be very overwhelming. I came to the conclusion that I would not wait for the government or the corporatocracy to step in and save the day (because it isnt going to happen) and not let fear cloud my ability to make sound decisions. I have chosen to alter my direct spheres of influence using logic and rationality to guide decision making. By focusing positive energy (instead of calculating the effects of negative doomsday scenarios) I would begin by softening the blow of any possible collapse. I began by preparing my home and my way of life. I then began informing friends and family of the possible scenarios that are unfolding just beneath the surface of media created American reality. This has been somewhat difficult and at times akward, with a large part just thinking that I am crazy. My conscious is clear I have given them information it is up to them to accept this information or not. I have decided to run for an elected position in the city and possibly the state. I figure that I can influence policy by making self sustainablity a part of the discussion. Many cities and states are facing budget shortfalls these eco-friendly and sustainable practices would save money or generate income for the cities or states. When people think that they are powerless they propagate the feeling, which in turn reinforces this abstract idea eventually making it not an abstract idea but reality. You can find some great information about stromberg 97 air cleaners right here http://airpurifiers.find-it-first.biz in case anyone is interested. This painting depicts an eerie preview of the last days. I would like to share its meaning with you as the Bible makes it clear. We are presently studying the book of Revelation in the Holy Bible. Chapter 18 tells about the "Fall of Babylon". Babylon has two meanings: 1)a False system of worship that will dominate the future one-world government (ultimately destroyed by the Antichrist) and 2)City where the evil spirit dwells. This is the city in the painting. It will be a great city (Verse 2). It will be a hideout of demons and evil spirits (Verse 2). Her sins will be piled as high as heaven (V.5). The tower of Babel written about in Genesis Chapter 11 was built by men in that day as a monument to their greatness. It was a great tower, which reached to the skies. Babylon represents man's pride, selfishness and no need for God. This attitude truly defies God. In Verse 4, John heard a voice from heaven calling "Come away from her, my people. Do not take part in her sins, or you will be punished with her". There are two people fleeing the city in the painting, one looks like a man and the other appears to be smaller, perhaps a woman. God will judge Babylon because He is a just and holy God. He is without sin, and cannot deny Himself. Verse 8 says "that Babylon will utterly be consumed by fire". The fire in the painting looks like it is coming from heaven. My opinion: The stage is currently being set for all of this to take place in the future. Satan's strategies are at work in this world and we cannot underestimate his power. There is hope if we trust in our Lord Jesus' promises. I am glad for His spiritual protection though I may be physically harmed. It is my prayer and hope that all who read this comment are as well. God Bless and thank you for giving me the oppurtunity to share.